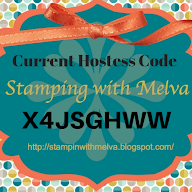 Stamp with Melva: Summer Heat Wave... and Embossing Techniques! It's been very hot on the west coast this year but finally this morning we woke up to a little bit of rain. Hopefully that will cool it down a little bit and give our poor grass that is brown some refreshment. 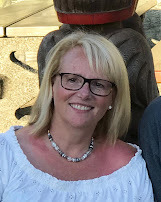 The one good thing about the heat is that I've been spending lots of time down in my craft room which is in the basement - staying cool! For the longest time I only used them by running them through my Big Shot with the paper inside to create amazing texture. That's just one way to use them. 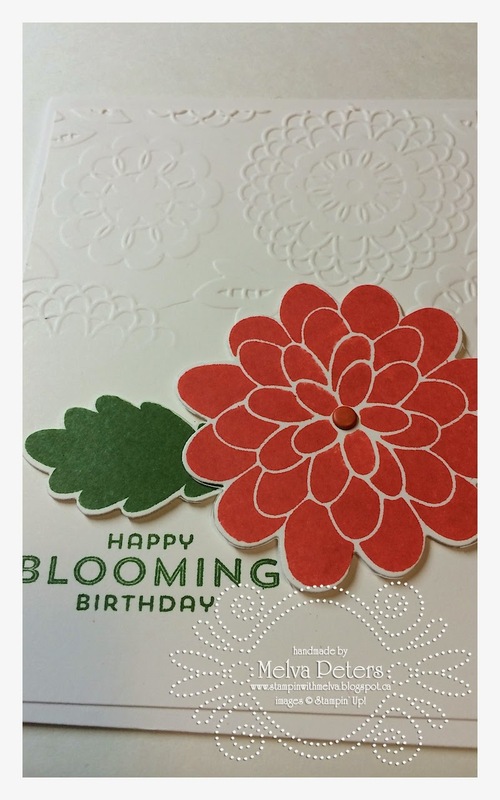 Insert your card stock inside your embossing folder and run it through the Big Shot with your platform on Tab 2. Ta Da! It creates amazing texture that pops up your card. 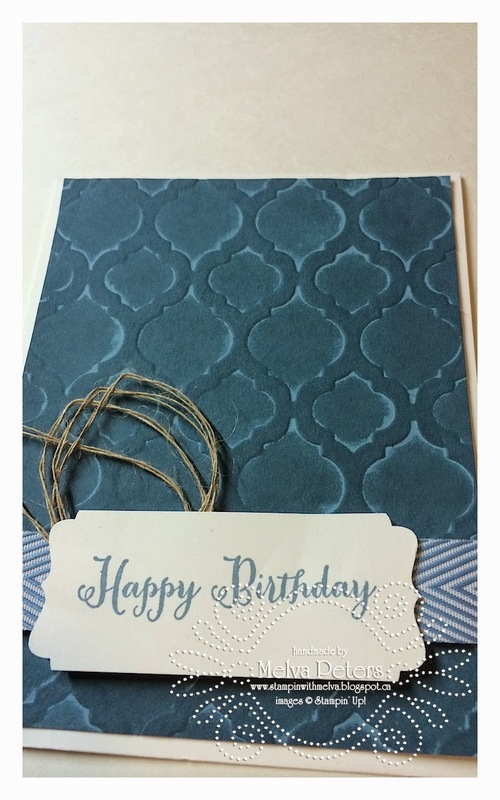 This sample was made with the Lovely Lace Embossing folder (Item 133737). 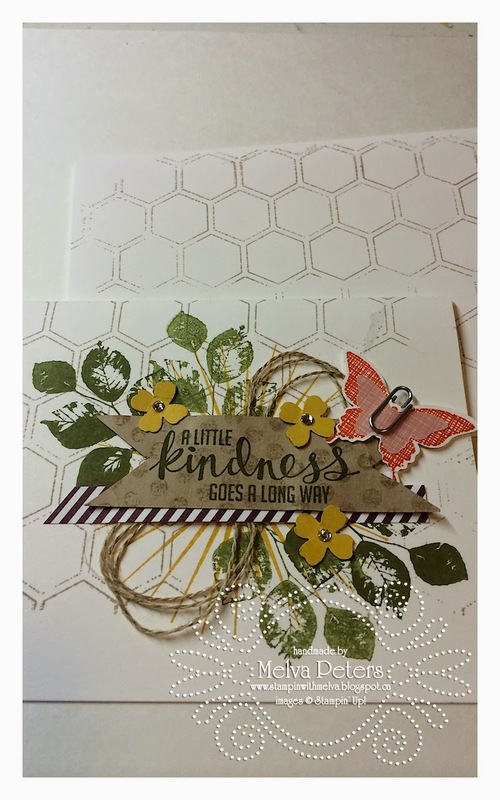 I've posted the next cards a few times - I love this card and the stamp set - Kinda Eclectic. 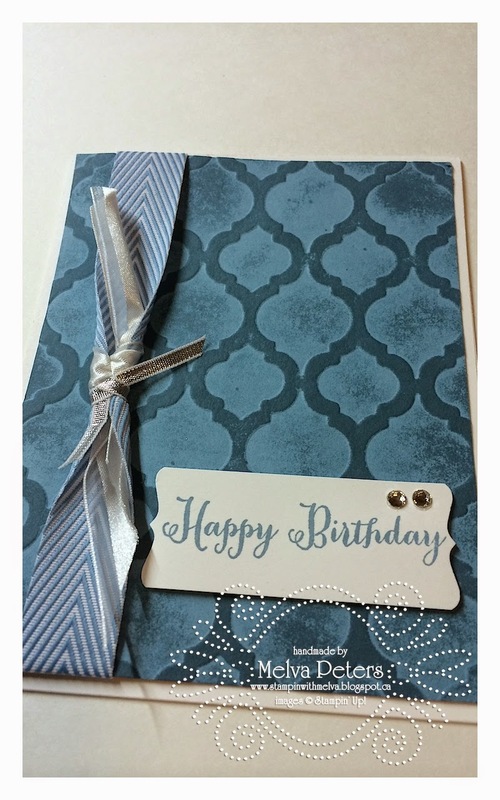 In this case, I lightly inked up one side of the embossing folder using the Crumb Cake ink pad and then put my card stock in and gently tapped it to transfer the ink. It adds a cool dimension to the card. You can then put your envelope in the embossing folder and do the same - no re-inking necessary! The last technique is to emboss your card stock and then take your Ink Pad (I used Marina Mist paper and ink pad) and run it over the embossed image. For the first card I tried only to ink up the raised image but in the second card I pressed harder and inked up most of the image. I love both of these! 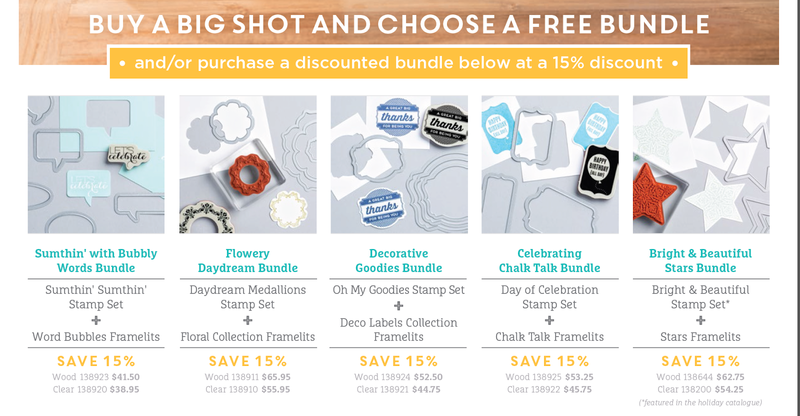 If you don't have a a Big Shot, there is a great promotion from Stampin' Up! on until August 31st. If you by a Big Shot you can choose from one of five bundles for FREE! 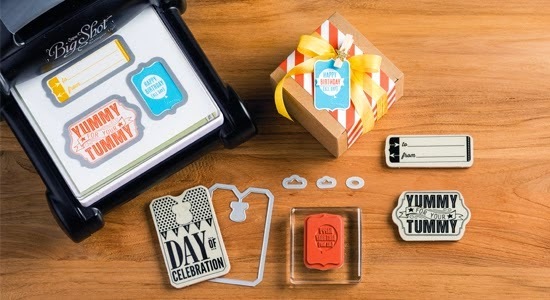 Bundles include a stamp set and coordinating Framelits! If you already own a Big Shot, you can purchase a bundle at a 15% discount. 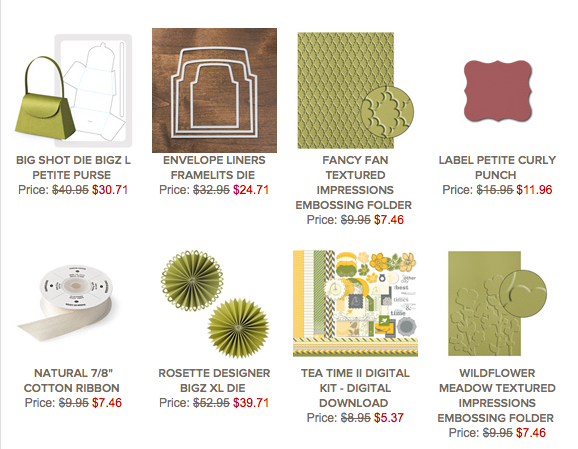 Remember you can purchase supplies from the Holiday Catalogue as of August 28th. I have catalogues in stock if you want to receive one - email me and I'll get one to you. That's all for this post - have fun and stay cool!